Singtel and Ericsson (NASDAQ:ERIC) are presenting their Assured+ Consumer Connected Device Solution (Assured+) at Mobile World Congress 2017, in Barcelona, Spain, demonstrating how they are leading the way with tomorrow's IoT technology and use cases. The demonstration, at Ericsson Hall 2, is a showcase of Singtel and Ericsson's partnership to co-create an IoT ecosystem for operators, networks and devices. Jointly developed by Singtel and Ericsson, Assured+ is an integrated IoT solution that will support eldercare, connected cars and other emerging IoT applications to provide universal connected life management for consumers. The solution addresses industry challenges where the IoT market is fragmented and lacks collaboration. Today, most devices, such as wearables, connected cars and smart home sensors are managed through specific applications that are typically place-centric and closed. Yuen Kuan Moon, Chief Executive Officer, Consumer Singapore, Singtel says: "In order to realize the full potential of IoT and offer our customers the best user experience, we need to ensure collaboration between people, devices and networks. Singtel believes an open ecosystem and the Assured+ solution will enable us to achieve these aims. By integrating standalone applications into one solution, Assured+ will bring convenience to our customers and pave the way for more IoT solutions, such as smart home, to be launched in a seamless manner." Per Borgklint, Chief Innovation Officer and head of Business Unit Media, Ericsson says: "Singtel's network expertise positions them as leaders of IoT connectivity initiatives. These advantages combined with their existing relationships with device manufacturers, large subscriber bases and established retail channels open the door to true IoT industry transformation opportunities." In the Ericsson Mobility Report, it is projected that there will be 18 billion IoT related devices by 2022. Assured+ will connect devices across existing 3G/4G networks, NB-IoT and LTE Cat-M. It will help accelerate adoption of these networks while providing fast time-to-market for new services. The solution will also provide an open and simplified experience for developers to add support to new devices and applications. With a user-friendly interface, Assured+ will give consumers a complete overview of all connected personal, automotive and home devices, with full control available in the outdoors and at home. Trials for Singtel mobile customers will begin later this year. 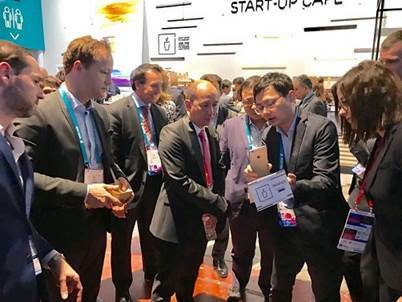 Singtel's Consumer Singapore CEO, Mr Yuen Kuan Moon, and other Singtel and Ericsson executives experiencing the Assured+ solution first-hand with Eric Qian, Head of IOT Innovation, and Per Borglinkt, Chief Innovation Officer, Ericsson.